The Thief River Falls branch of Border State Bank has 19 employees who raise money throughout the year through various activities. 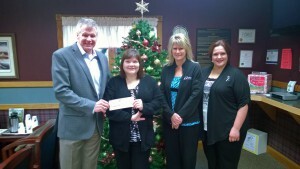 This is the sixth year Border State Bank has chosen Hospice as the recipient. The donation will be used to provide compassionate end-of-life care to those in Thief River Falls and surrounding communities. From left to right: Curt Seter from Hospice of the Red River Valley, and Jessica Porter, Karen Korpi and Bethany Packard from Border State Bank. Jessica Porter, Consumer Loan Servicing Specialist at Border State Bank, said they chose Hospice of the Red River Valley as the beneficiary because of the organization’s impact on the Thief River Falls area. “Our community appreciates the kind and caring service provided by Hospice, and we look forward to continuing our fundraising efforts to provide future support,” Porter said.